We are back in Puerto Ayora after a wonderful week of navigating through the Galapagos. We have seen so much of this little paradise! We spend the week on the Floreana yacht, which is a small former fishing boat with room for 16 passengers and 7 crew members and a tour guide. Nothing very fancy, but just what you need. We learned that the price we paid was very good compared to what others paid, so booking last minute pays of and is well recommended. Another option is to book directly at the cruise boat itself, instead of booking through an agency (www.yatefloreana.com). Aboard the Floreana they have 2-persons cabins with bunk beds and a private bathroom. We shared the boat with 13 other passengers: A young couple from Switzerland, a couple from Germany (who are in a similar situation: resigned their jobs and travelling for 10 months), a Swiss mom who took out her two young kids from school to travel for a year, two Spanish wildlife photographers from Barcelona (www.photosfera.com, got compliments for my pictures and lots of tips :)), a girl from Barcelona, a couple from California, and a Canadian who is travelling for over 1o years now. A very young and mixed group, which was great! Probably a good thing we went for the more budget option, rather than a luxury cruise, where the age is differently distributed. When we booked the trip we were told that this boat has one of the best itineraries, but that was the sales agent’s opinion… However, most of the people on board had that as their reason to book this trip as well: one of the best itineraries. And that was indeed very true! We were very lucky with our guide, Victor Hugo Mendia. Besides being a very informative guide, who was strict when necessary (2m from the animals! ), he also made sure we got most out of the day and were able to do a land visit and snorkeling at most of the places. Each cruise boat gets a particular time slot to visit a location, and as we saw some of the other boats only managed to do a land visit and skipped the snorkelling. And then to the most important: what did we see?! So much! We had a really good start at Santa Cruz: Lots of giant Tortoises calmly puddling in the mud at El Chato. A magical place in the late afternoon light. At Isla Genovesa we were in for another treat: this island is full of boobies and other birds! 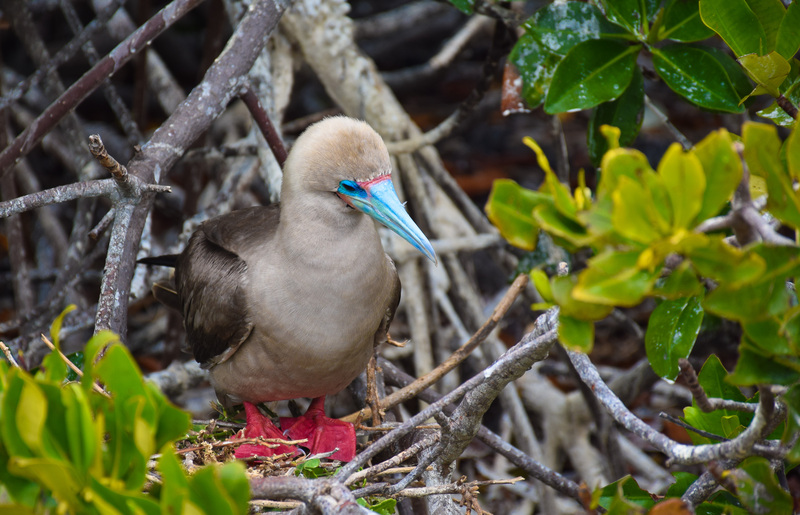 Especially Red-footed boobies and Nazca boobies were very common. We also saw many other species of birds like the Frigatebird. Everywhere where you looked were birds flying, nesting, and so close! And sea lions of course :). We had our first snorkel here from the beach: not so many fish yet, but that came later. Another snorkel after lunch, which also meant my first encounter with a white-tipped reef shark! I have to admit I was a bit scared when suddenly a >1m shark swims past you at about 2 meter distance! And there is video footage to prove this, including me desperately trying to swim away! At Isla Santiago we visited the beautiful lava fields from an eruption that happened in 1891. The snorkelling at this place was superb again. Besides a couple of additional scary white-tipped reef sharks we swam with turtles, penguins and sea lions!! In the afternoon we walked up to the San Bartolome viewpoint, to see one of the most famous views of the Galapagos Islands at sunset. The following day we visited ‘Chinese Hat’ at Isla Santiago, which is a beautiful location with white beaches, clear blue water and colourful vegetation. And lots of playful baby sea lions :). The snorkelling at this place was like swimming in an aquarium: lots of small colourful fish in exceptionally clear waters providing great visibility, and some rays. At Isla Isabela we had an early start: first activity at 06:00 to make sure we could do both the land visit and snorkeling at Las Tintoreras. Lots of marine iguanas are living at this island, and again lots of sea lions too. During snorkeling we were swimming between giant turtles, I counted at least 10! Ralph also captured a 2m wide Spotted Eagle Ray. In the afternoon we visited the Tortoise breeding center to learn about their work. Because of all the introduced species at the island (dogs, cats, goats, rats etc.) it’s almost impossible for the giant land tortoise babies to survive. Therefore the breeding center makes sure they grow big enough before put into the wild. At Fernandina Island we visited the only open land spot of this place: Punta Espinosa. Here lots and lots of marine iguanas were soaking up the morning sun to warm up and get energy to move. We also encountered the Flightless Cormorant here. A funny bird with little wings that cannot fly, but are excellent swimmers and divers. We hoped to see the marine iguanas feeding under water while snorkeling. This did not happen unfortunately, apparently they were not warm enough yet. But we did see a lot of giant turtles again. More then we saw before! Also we got to see live how the Flightless Cormorant catches his fish underwater, really cool to see! And Ralph managed to do another dance with two playful sea lions (I was already out of the water by then, the sea is pretty cold in the Pacific! Good thing we have wetsuits…). The next day (after a very choppy night navigation…) we did a land visit at Isla Santiago, this time at Puerto Egas. Here we saw the less common and shy Galapagos Fur Sea lion, and the Galapagos Hawk. Snorkeling at this location was amazing. Again so many turtles! It was like swimming through a meadow with grazing turtles. And they are so big, most of them definitely 1 to 1,5 meters. And again we had a surprise visit from two sea lions. Rabida Island is a beautiful red colored island, where we had a nice walk. It is amazing to see how the landscape differs from one island to the other. During snorkeling we saw lots of colorful fish and again more sea lions! After all those beautiful experiences we decided to stay at Santa Cruz Island for the remaining days. We have seen so much that we need a couple of days to relax and process what we have seen. Tomorrow we will catch our flight to Lima, and start our Peru leg of this trip! Wat een byzondere dieren,een belevenis,prachtig😘.kees en erica.